Nineteen year old Jim Yoder has his life under control until he ends up a fugitive in Hitler’s third Reich. As he journeys across Europe Jim encounters other fugitives, traitors and resistance fighters. Will he make it home to tell his father and the girl he loves that he trusts God? I have read this book three times. Once on my own, and twice out loud. I started reading it to my dad while we were on vacation, but we didn’t finish till we got home. Then I had to start it again because my mom and brother wanted to know what happened before the part they heard! Everyone enjoyed it, and I highly recommend Gunner’s Run. 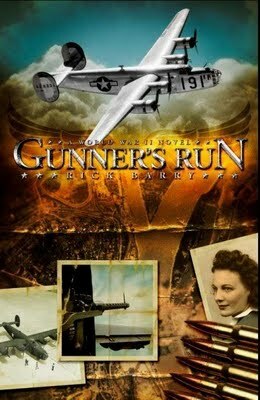 Make sure you come back on Wednesday for an interview with Rick Barry, author of Gunner’s Run. Read the interview and found it extremely informative and helpful. Rick must have alot of support for his writings historically and otherwise. Can’t just walk into something like this and get away with it.